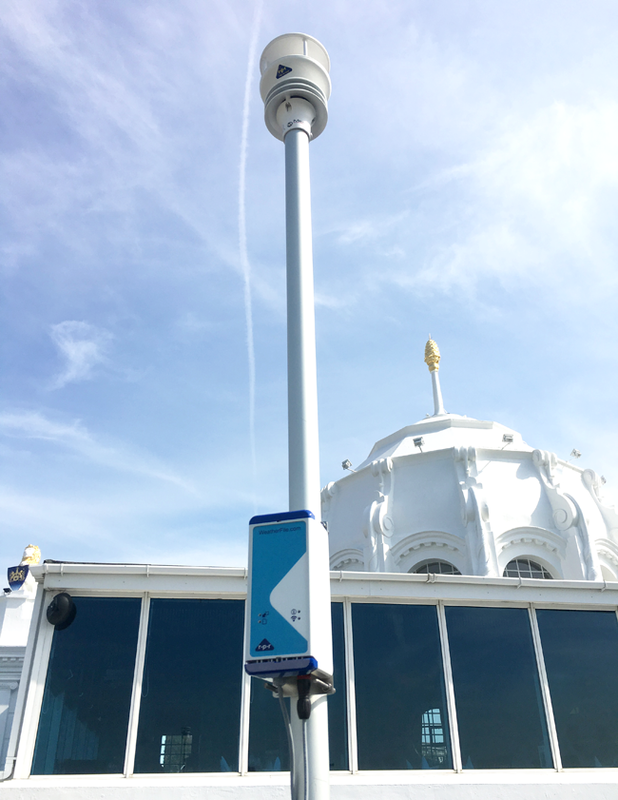 Richard Paul Russell Ltd has recently extended their WeatherFile network in the Solent with the addition of a Gill MaxiMet GMX 500 sensor at Southampton Boat Show. Richard Paul Russell Ltd have partnered with Kuti’s Brasserie to deliver high quality wind and weather data to YachtMarket.com Southampton Boat Show exhibitors and visitors. The sensor used is the from the MaxiMet range designed and manufactured by Gill Instruments. MaxiMet sensors are reliable, high quality instruments that provide accurate meteorological information in a wide variety of applications. The Gill MaxiMet GMX500 sensor located on the roof of Kuti’s brasserie has a built in compass that will always find north thus increasing further accuracy regardless of sensor movement. One of the main challenges Richard Paul Russell Ltd faced when fitting this unit was to overcome the lack of Wi-Fi internet access. Our newly developed WeatherFile Mobile Unit (WMU) allows data to be gathered directly from the Gill MaxiMet GMX500 sensor and sent to our WeatherFile website over the GSM mobile cellular network. The result is live data through WeatherFile completely independent of local internet and separating data transfer from the customers own Wi-Fi network also removes any associated security risks. Visitors to the show can now accurately check live weather data and take advantage of fine dining on the roof terrace of Kuti’s with great views of the show and the Solent. Further applications for this system could include weather monitoring for temporary structures, outdoor events, festivals and health and safety site operations and many others.